These are some of the organizations the Dixie Chicks have offered their time to during the past few years. The Dixie Chicks raised over $100,000 in a single sell-out concert for St. Jude on July 29, 1999 in Charlotte, N.C., marking the largest amount of money ever raised from a concert for St. Jude. St. Jude Children's Research Hospital, located in Memphis, TN, is world-renowned for providing exceptional care for children with cancer, leukemia and other diseases without regard to race, religion or ability to pay. The Dixie Chicks were part of the nationwide anti-drug musician campaign. PSAs aired on television stations across the country targeting nine to 13-year-olds and by emphasizing the creative, positive things youths can accomplish without drugs. VH-1's "Rock & Roll Jeopardy"
Emily emerged victorious as the trio raised $9,500 for VH-1's Save The Music, the National Coalition Against Domestic Violence and the World Wildlife Fund in July 2000. The Dixie Chicks supported the World Wildlife Fund in conjunction with their sophomore album FLY and their first headlining arena tour "The Fly Tour." One dollar from the sale of each ticket went to the organization. Also, a portion of the proceeds from the sale of the album went to aid WWF. The Dixie Chicks teamed up with Rosie O'Donnell during the Fly tour to record "Merry Christmas From The Family" for the CD Another Rosie Christmas. This was done live during a concert in Detroit, Michigan. The Chicks donated their proceeds from this album to the foundation. Rosie O'Donnell established her For All Kids Foundation, Inc. in 1997 to provide financial support to nonprofit programs serving economically disadvantaged and at-risk children and their families. Since its inception, the foundation has helped thousands of children across the country through grant awards to child care, early childhood education, after-school and other essential programs. The foundation's main focus is center-based child care, and first priority is given to programs serving low-income, urban areas, where many families struggle to find quality child care and early childhood education programs. In February 2001, Emily Robison competed on ABCs popular game show "Who Wants To Be A Millionaire" raising $32,000 for the Nature Conservancy of Texas. Emily, who lives in San Antonio, Texas, earmarked her winnings to save wildlife habitats in the Texas Hill Country of the Lone Star State. After the birth of Natalie's son Slade in March 2001, she and her husband Adrian Pasdar asked that in lieu of gifts, donations be made to the Texas Pediatric AIDS League. The organization's mission is to identify and address the needs of infants and children who are infected by HIV/AIDS. The group provides several programs to help these children live in as normal an environment as possible. The Dixie Chicks recorded an a capella version of the "Star Spangled Banner" to raise additional monies to support the American Red Cross efforts to aid the victims and families of the September 11 tragedies. The special version of the National Anthem was made available for download at the Dixie Chicks website. The group also participated in a special PSA campaign for the organization. The Dixie Chicks performed "I Believe In Love" during an unprecedented cooperative and collaborative effort of ABC, CBS, FOX and NBC. "America: A Tribute to Heroes," the live two-hour, commercial-free, simulcast raised funds for Americans who directly suffered from on September 11. The historic event raised $128 million for The September 11 Fund. In addition to the telethon, royalties and net proceeds from the companion CD and DVD continue to raise money for The Fund. To date, the DVD has been certified Double Platinum, selling more than two million copies and the CD has been certified Gold, selling over 500,000 copies. On October 18, 2001 the Dixie Chicks joined legends Emmylou Harris and Pat Benetar, along with Sheryl Crow, Mary J. Blige, Beth Nielsen Chapman, Nelly Furtado, & Shea Segar on Lifetime Television for their annual charity concert. The two-hour special raised awareness and funds to benefit the National Alliance of Breast Cancer Organizations (NABCO) and the National Breast Cancer Coalition (NBCC). The annual "Women Rock! Girls & Guitars" concert is part of the Networks ongoing, award-winning public awareness campaign, Our Lifetime Commitment: Stop Breast Cancer for Life. Natalie, Martie and Emily teamed up with Buck Owens and Keith Urban in a head-to-head battle against some of television's most beloved, classic Muppet characters including Kermit the Frog, Johnny Fiamma & Sal, Sweetums, Pepe, Dr. Phil and many others on Family Feud. The five Muppets Face the Music shows aired November 2001. The Dixie Chicks & Friends winnings totaled $80,000 for St. Jude Children's Research Hospital and the Muppets won $20,000 on behalf of Save the Children. 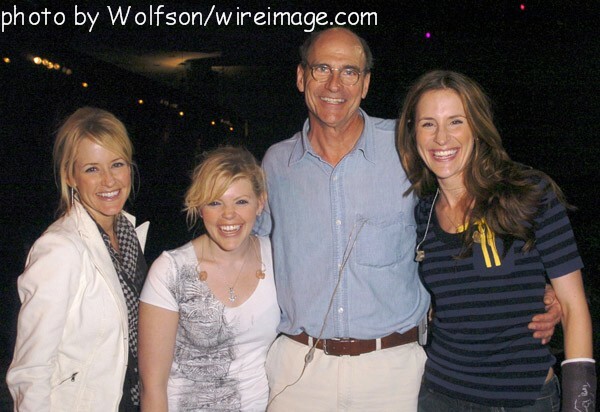 On May 23, 2002, The Dixie Chicks performed in a televised concert to benefit VH1's Save The Music Foundation. This concert generated $1.4 million to help fund music classes for public schools nationwide. Other performers during the event were Celine Dion, Cher, Mary J. Blige, Whitney Houston, Shakira, Stevie Nicks, Anastacia, and Cyndi Lauper. Emily and Charlie Robison requested that donations be made to Make-A-Wish in lieu of gifts after the birth of their son Gus on November 11, 2002. During December 2003, through Country Weekly magazine and secondharvest.org, a limited edition autographed Home poster was offered for a donation to the organization. Second Harvest is America's largest domestic hunger-relief organization and provides emergency food to more than 23 million hungry Americans each year. The Dixie Chicks, Mary J. Blige and Boyd Tinsley teamed up with Blue from American Express to announce "Blue For Save The Music," a new program in partnership with the VH1 Save the Music Foundation designed to bring greater attention to the lifelong benefits of music education and to restore music education programs in America's public schools. American Express launched the yearlong program in conjunction with the Grammy Awards taking place on February 23, 2003 in New York City. The Dixie Chicks filmed a PSA which first aired during the Grammy Awards. Blue For Save The Music will raise awareness about the importance of music education in a variety of ways and has pledged to raise $1 million this year to help restore public school music programs at a time when funding for music education is being cut or eliminated nationwide. The first release of the Texas Music Project, "Don't Mess With Texas Music", which brought together Texas musicians like Founding Chair Willie Nelson, Clint Black. Erykah Badu, and the Dixie Chicks, generated more than $500,000 in publicity for music education and will contribute more than $125,000 to music education programs beginning September 2004. The CD, released September 2003, has become the best-selling Texas compilation CD in history. The Dixie Chicks contributed "Some Days You Gotta Dance' to the CD. The primary mission of TMP is to help strengthen and restore rigorous music education to Texas schools and raise awareness of the positive impact music education has on students, and promote Texas music. 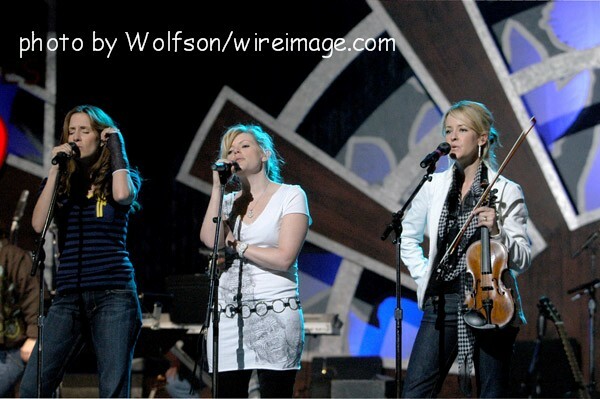 The Dixie Chicks, along with the Indigo Girls and Ben Folds, performed a charity concert in Charlotte, North Carolina on October 10, 2003 for the Honor The Earth organization. Martie and Gareth Maguire announced that in lieu of gifts upon the birth of their twin daughters, donations be made to Families of SMA. Families of Spinal Muscular Atrophy - a volunteer driven non-profit organization founded in 1984 by parents of children with SMA. FSMA is the largest international organization dedicated solely to eradicating SMA. SMA is the #1 genetic killer of children under the age of 2 and there are more than 7 million carriers in the USA alone. Martie chose Families of SMA after meeting a family and hearing of the loss of their beautiful son Andrew, who was only 6 months old when he lost his battle to SMA. Providing medical relief worldwide, Médecins Sans Frontières (also known as Doctors Without Borders or MSF) delivers emergency aid to victims of armed conflict, epidemics, and natural and man-made disasters, and to others who lack health care due to social or geographical isolation. HeartGift's mission: To provide lifesaving heart surgery to disadvantaged children living in developing countries where specialized medical intervention is scarce or nonexistant. The Dixie Chicks have contributed their version of Kermit the Frog's "Rainbow Connection" to the CD Mary Had A Little Amp. It also features R.E.M., Roseanne Cash, Dave Matthews, and others. Proceeds from the album will benefit Project Kid Smart and Start Smart America. "This CD is the result of the efforts of many artists and activists. We asked the Dixie Chicks to help us make preschool education a national priority and they stepped up to the plate. The Dixie Chicks' involvement in this project was enormously important to our outreach to other artists," says Project Kid Smart Director Julie Burton, explaining the origin of this unique CD compilation. "Maybe the most miraculous thing about being a mother is seeing the incredible capacity a young child has to learn. Imagine if all children in our country had the chance to go to a good school early on and soak up the kind of skills and knowledge that a quality preschool education provides? We were thrilled to help with this exciting project," say the Dixie Chicks. The Chicks performed "I Hope", during the September 9th broadcast of Shelter from the Storm: A Concert for the Gulf Coast. Funds were raised for the Red Cross and The Salvation Army during the one hour show. The Dixie Chicks released "I Hope" as an exclusive digital download benefiting hurricane relief efforts on September 27th, 2005. Dixie Chicks and Sony BMG Music Entertainment will donate all of their proceeds from the sale of "I Hope" to Habitat For Humanity and the American Federation of Musicians Gulf Coast Relief Fund, in support of the Hurricane Katrina relief efforts. Located in Austin, Texas, Thoughtful House is fighting for the recovery of children with developmental disorders through the unique combination of medical care, education, and research. Emily is a Thoughtful House board member and Martie, along with husband Gareth, acts as an advisor. The Chicks have appeared at benefits for TH, including playing in the Thoughtful House Celebrity Softball Game in November 2005. **Now under the name The Johnson Center for Child Health and Development. The Dixie Chicks were one of many artists who performed at the 2006 MusiCares Person of The Year benefit to honor James Taylor. The evening was a fundraiser for MusicCares, a nonprofit organization that provides assistance to those in need in the music industry. Photos: Chicks with James Taylor, Rehearsing, On The Red Carpet The Chicks also played at the 2007 MusiCares POTY honoring Don Henley. Fire Relief: The Concert for Central Texas raised $725,000 for wildfire victims. The October 17, 2011 concert was organized by musicians Ray Benson and Eric Johnson, along with others from the Austin music community. Performers included the Dixie Chicks, Lyle Lovett, Willie Nelson, and George Strait. Over the past few years, the Dixie Chicks have also donated items for charity auctions. Some of the beneficiaries have included the National Breast Cancer Foundation, Nashville CARES, the T.J. Martell Foundation for Leukemia, Cancer and AIDS Research, Children's Advocacy Centers of Texas and St. Jude's Children's Research Hospital. One of the charities the Dixie Chicks regularly participate with is the Make-A-Wish Foundation. The foundations mission is to "grant the wishes of children with life-threatening illnesses to enrich the human experience with hope, strength and joy."